In general all banks are safe as they are very closely regulated. Co-operative banks are the riskiest of the lot mainly due to mismanagement and political interference. Even government owned banks have poor lending practice as the recent NPAs show but the depositors need not worry as in worst case government would print money and pay back depositors. Also government would not let big private banks to fail as it would have very adverse impact on economy and other banks. As far as foreign banks are concerned I would say they are safer than co-operative banks and riskier than big private banks. Deutsche is in this category! really you provide a great list and i appreciate you from bottom of my heart. Can I open an RD for 9 months? Yes most banks allow recurring deposit for minimum 3 months and maximum 10 years in multiples of 3 months. You can get the complete list of banks on RBI website. State bank of Mysore is not in the list? Bandhan bank is not co operative bank from wb. Bandhan bank is small private bank and not co-operative bank. I want to invest 10000/- month ,which bank is perfect for me. You can invest in any of the above listed banks depending on your convenience and interest rate offered. You should be careful in case you deal with co-operative banks. I am paying tax for salary. But I want to invest 5 lakhs for 5 year on a tax saving FD. After 5 years, how much I have to pay for tax from income. Ideally TDS would be deducted from the interest you receive on FD every year, so it’s good practice to show interest received every year as income and pay tax on it. The interest received is added to your income and taxed at your tax slab. You can get more details and comparison of Tax Saving FDs here. Assuming you open RD at the interest rate of 8% for 1 year. You would get Rs 530 as interest in a year. At TDS rate of 10% – Rs 53 would be deducted by bank and submitted to I-T department. So you would get Rs 477 as interest. However remember, in case you are in higher tax bracket, you would need to pay additional tax. Is matured RD proceeds amenable for TDS? Yes effective June 1, 2015 there would be TDS on interest paid on Recurring Deposit, if the interest exceeds Rs 10,000 in a financial year. 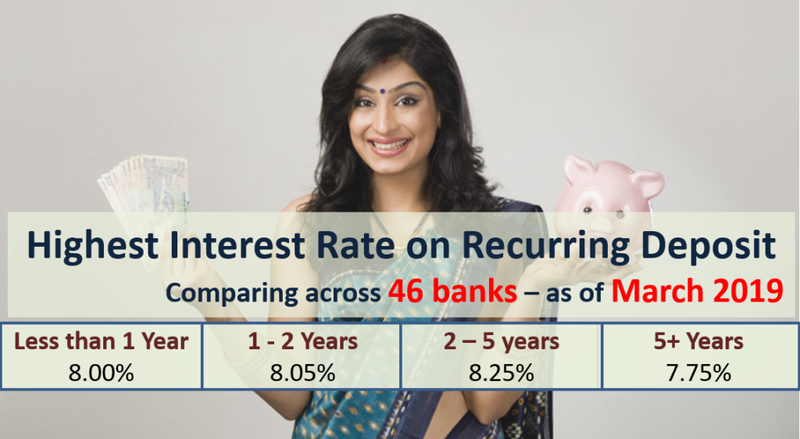 You can read more details here – TDS of Recurring Deposit. As of now Post Office is offering higher interest rate on RD. But Post office RD is available only for 5 years term.